After finishing last week’s climbs in Kyushu, I decided to travel home by a slower, and often (wrongfully) underrated means of transportation: an overnight ferry across the Inland Sea. 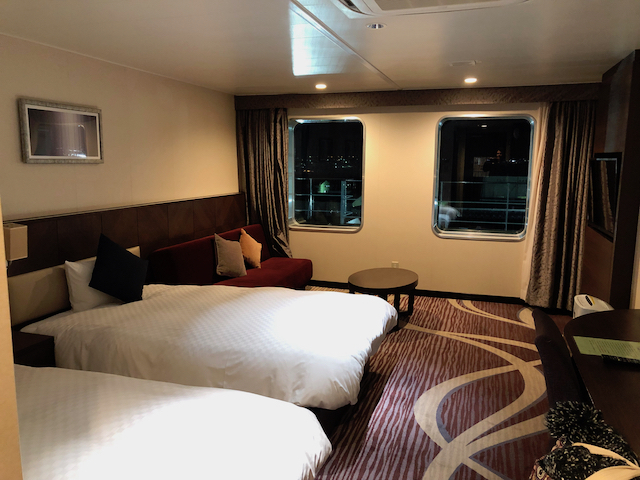 The shinkansen (bullet train) is faster, and the overnight bus much cheaper, but overnight ferries have a surprising amount to offer . . . especially when you splurge on a private room. Like most Japanese ferries, the Meimon Taiyo ferry that sails between Kitakyushu and Osaka (the black line on the map below shows the route) offers several classes of accommodation. People who want a little more privacy can opt for shared, semi-private rooms (4 bunks) or private accommodations that sleep 1-4 people (for a higher price). I wanted to splurge, so I opted for the top-of the top: a private suite. I arrived at the ferry terminal on a grey, rainy afternoon. I worried about arriving late, so I took the courtesy shuttle to the port three hours before my boarding time. (Admittedly, this was overkill.) I sat in the waiting area playing solitaire on my phone and reading ebooks–which was pretty much what I would have done at the train station, so I probably didn’t lose anything of value by catching the early bus, and it soothed my worries about missing the boat, so on balance, the wait was not so bad. It also meant I was literally the first person to board the ferry when the time came. I retrieved the key to my suite from the information kiosk, bought some snacks and postcards in the gift shop, and headed up to Deck 8 to find my suite. The suite lay at the far end of a long, long hall, past a row of deluxe single rooms. To my immense surprise, the ship had only two suites. My suite – good grief! It’s beautiful! 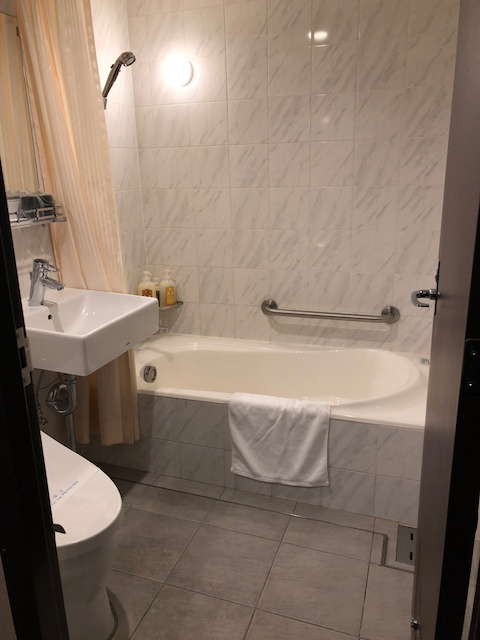 It even had a private bathroom with a full-sized soaking tub! Larger than some of the hotel rooms I’ve stayed in . . . I admit to dancing around the room like a little kid, pressing my nose to the window to watch the lights and spending far more time than necessary deciding which of the beds I planned to sleep in. 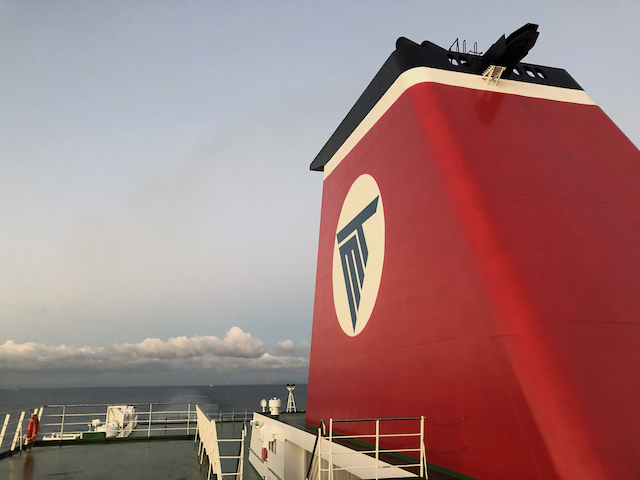 My passage also included two meals–dinner and breakfast–in the ferry’s Western-Japanese restaurant buffet, so I headed down to the Deck 6 restaurant before the ship left port and secured a window seat. From there, I enjoyed a leisurely, delicious dinner of curry rice and vegetables while watching massive trucks drive into the ferry’s cavernous holds. 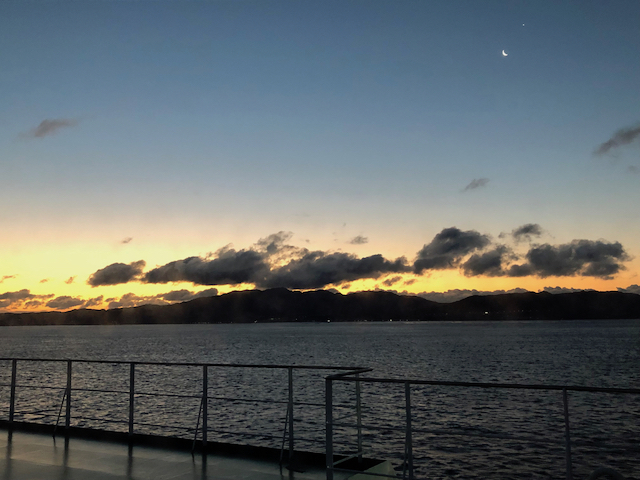 The ship left port just as I returned to my seat with dessert, and I watched the lights of Kitakyushu recede into the distance as I savored a steaming cup of coffee topped with vanilla soft-serve. I could have stayed awake all night, watching the twinkling lights pass by on shore–the larger constellations of cities, interspersed with the scattered pinpoints of the towns and coastal villages between. However, I wanted to see the sunrise, and we were due to arrive in Osaka at 8:30am, so I decided to take a bath and head to bed early. 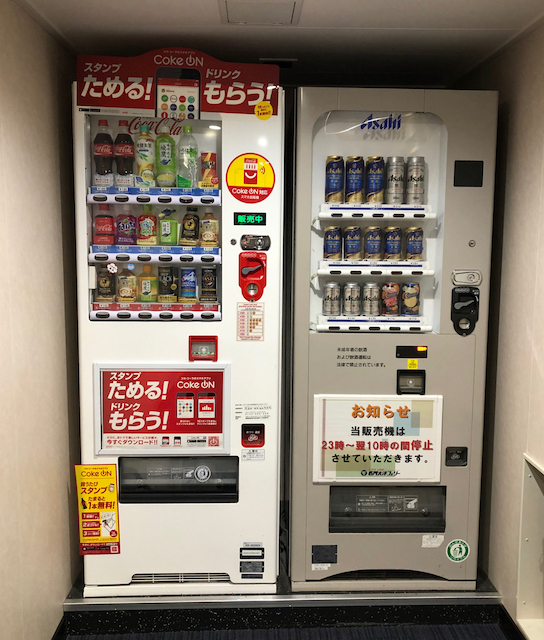 Vending machines on Deck 8 – they’re everywhere in Japan. While I soaked in the bath, the ship made several turns (most likely circumnavigating one of the many islands that dot the Inland Sea). Each time, the bathtub–and its water–canted sideways, making me think about the oddity of sitting in a tub full of water that was itself sitting inside a tub (a boat) that was sitting in the water. A strange sensation, indeed! Clean, warm, and dry, I fell asleep looking out the window at the moonlight dancing on the water of the Seto Sea. The following morning I woke before dawn and headed onto the observation deck to photograph the sunrise. Good grief, it was cold! Large bodies of water are often windy in the morning. Add to that the freezing temperatures common to southeastern Honshu in January and the fact that the sun hadn’t risen yet, and I think I managed to stay on deck for about three minutes before my fingers, ears, and nose began to ache from cold. I snapped a few photos and headed down to the restaurant for breakfast. 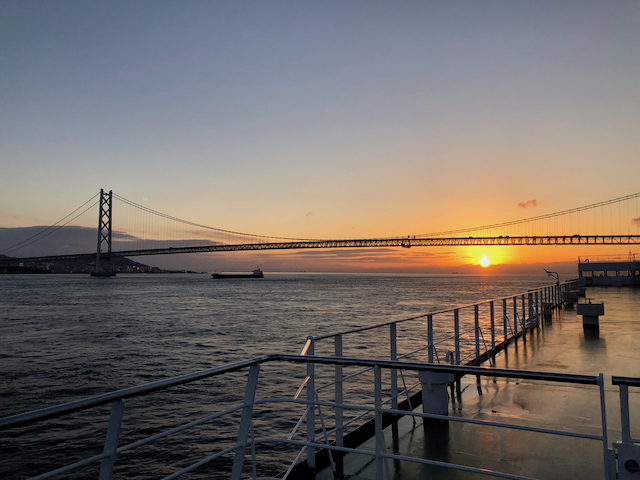 After eating–and several cups of coffee–I braved the observation deck one final time, to photograph the sun as it appeared on the eastern horizon, just as we passed beneath the massive bridge near the entrance to Osaka harbor. This photo was worth the cold. As we docked, my only regret was that the trip hadn’t lasted longer. I enjoyed every moment of my ferry adventure, and can’t wait to take another one. I suspect I may have found a new favorite method of travel in Japan. Do you like ferries, or traveling by ship? If you’ve never done it, would you like to try? When I went to Busan I went from and to Osaka, so we covered some of the same gloriously beautiful route at slightly different times, but I was cheaper — uh, more frugal — than you and had half of a two-person cabin with a random roommate going out and an empty coming back. But it was below decks and I would so much have loved your windows! Next time I may splurge, though we did have a gigantic Grand View Bath (women and men separately) that sloshed nicely! Great, great trip! I love ferries! Thanks for sharing this! When driving the inside passage of Alaska, our family took many ferries, one of which was an overnight. My BFF and her daughters took a private suite, and my sons opted to sleep in commons, but I spent the night “camping” on deck with a host of strangers who created the warmest atmosphere imaginable on what proved to be a magical choice. The people on deck shared food, played music, and put up windbreaks. The sun never quite set, and I spent an amazing gloaming all night long!